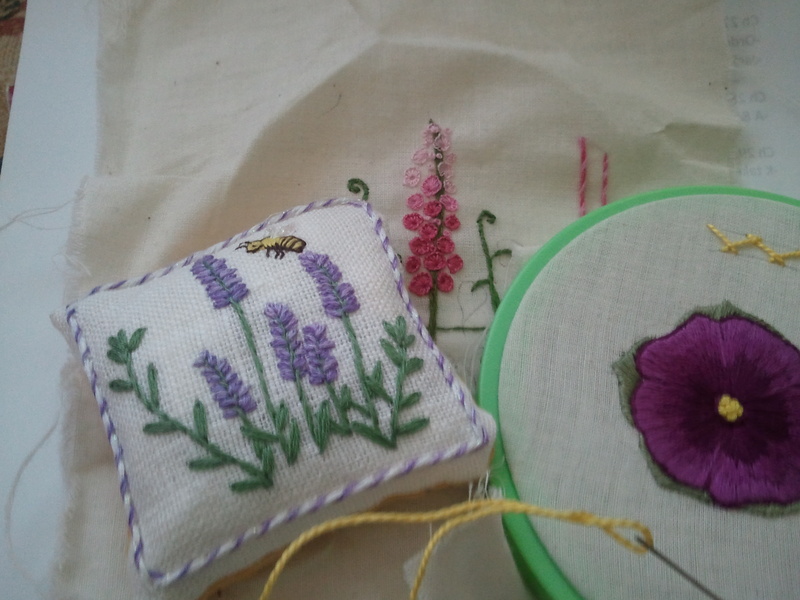 The buttonhole stitch larkspur is something I’ve been wanting to try, because: pretty, and in the hoop is a hibiscus, which is also an opportunity to practice long and short stitch. Does anyone else do this? What do you do with the finished pieces? This entry was posted in Uncategorized and tagged embroidery, flowers, surface embroidery by Rene. Bookmark the permalink. I love your larkspur flower. It reminds me of Diana Lampe’s style. I do ‘samples’ like these sometimes – I never know what to do with them, either. They tend to lurk together in a shoe box, labelled ‘in progress’ – but they never come out again, so there *is* no progress! Thank you! I had to look up Diana Lampe– wow, her work is lovely. Putting the samples together in a box is a step I need to take. Mine are scattered in various craft bags around the house. It would probably be a good idea to centralize them, so if I ever want to go back to them for future reference I could actually find them!